The City and County of San Francisco (City) is in the thick of bargaining with its unions whose contracts are open for negotiations. The labor project encompasses 37 unions covered by 26 different contracts, affecting about 30,000 employees. The City Charter provides a process by which contract agreements must be completed and sent to the Board of Supervisors by May 15, 2019. The City recently released its Five-Year Financial Plan update for Fiscal Year 2019-20 through Fiscal Year 2023-24. The outlook is similar to what we have seen over the last several years: The City is not in a recession, cutting services, or laying off employees. However, the City is seeing indicators of slowing economic growth, while facing continuing cost pressures and uncertainty ahead. The bottom line? The City is at the table with labor partners to negotiate new contract agreements that provide continuing fair wages for employees, while balancing other City priorities. 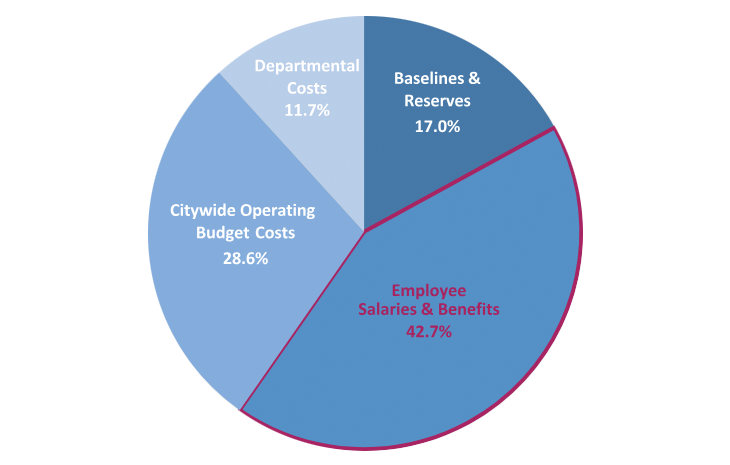 In the near term, the City faces pressure from growing employee costs—especially for pensions and healthcare. Another big challenge is the shift the state made, from paying for In Home Supportive Services (IHSS) to requiring local governments to pay those costs. This alone amounts to $93.4M in new costs by FY 23-24, and represents 57 percent of the increase in departmental costs shown in Chart 1. The City also has a large number of voter-mandated baselines and set-asides, including the Municipal Transportation Agency (MTA) baselines, Library Preservation Fund, and the Children’s Services Fund baseline, among many others. In the longer term, the risk of a recession is the greatest source of uncertainty. Costs the City will incur to keep the Housing Authority functioning, and new requirements or changes brought about by state and federal legislation also pose substantial risks. The Mayor has instructed departments to continue responsible fiscal policies that limit ongoing cost growth by making every dollar count; ensuring every position and all funding achieve their highest and best use; and that any new positions or funding align with the Mayor’s priorities. San Francisco’s employees deliver a wide range of services and include nurses, carpenters, wastewater treatment plant operators, transportation planners, social workers, firefighters, librarians, and so many more. The City’s negotiations follow a process and timeline specified by the City Charter, which results in contracts going before the Board of Supervisors for approval by May 15. Charter section A8.409 lays out the process for almost all non-safety employees, along with impasse procedures should the parties fail to reach agreement. With few exceptions, in situations where the union and the City cannot agree on a contract, the parties present their cases to a neutral third party whose decisions are binding on both parties. This process benefits the City, the unions, and the public by eliminating the disruptions caused by strikes. Members of the news media with questions about the negotiations should contact Susan Gard at Susan Gard or at 415.557.4800.